From the Santilli Kitchen to Yours! No – bake desserts are the perfect summertime delights. No oven? No problem! Ah….the strawberry……a blissful reward from summer’s bounty! I like to make these little beauties for Memorial Day or 4th of July gatherings. Most people think it takes gourmet skills to prepare such delights, but you and I know that it only takes a little time and patience; and trial and error! Try to pick out berries that are somewhat uniform in size and are full. Okay…..lets get ready! We need to rinse the strawberries really well to remove any dirt or debris. Now, cut around the top carefully and clean out with a pairing knife. Strawberries are delicate, so be gentle! Next, in a medium mixing bowl, beat cream cheese, sugar and vanilla extract until very creamy. Put the cream cheese mixture in a pastry bag or in a ziplock bag with a corner snipped off and fill your strawberries. 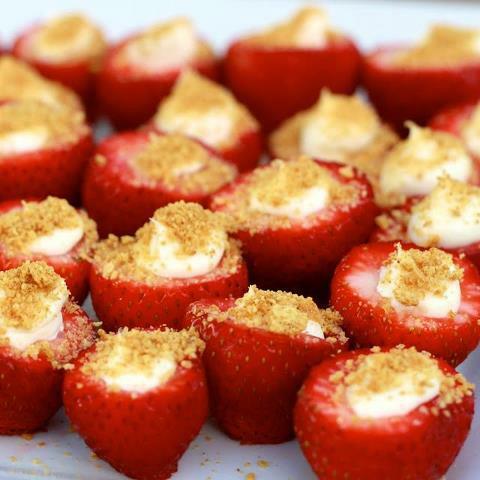 Once your strawberries are nicely filled, dip in graham cracker crumbs for effect. You may also drizzle chocolate on top of your creation too. If you are not serving immediately, put in refrigerator. Two of my absolute favorite things: Cheesecake and strawberries! Oh, you are just attacking my self-control, aren’t you? This is wonderful Kim. I make these also. Here’s the link http://www.savorthefood.com/blog/cheesecake-stuffed-strawberries/ .